I hope you don’t mind me being self-indulgent and gushing about the fantastic dream I’ve been living in the past 10 weeks. If you do…well, I give you permission to skip this post. I’m currently performing the musical South Pacific, at a resort in southern California. It’s my second time playing this role, and this production is the regional premiere since the Lincoln Center production. 2013 is the 55th anniversary of South Pacific the movie and it just so happens that our show’s producer is good friends with none other than Mitzi Gaynor, who played my role in the movie. During tech week I found out Ms. Gaynor would be attending our press night during opening weekend. Hmmm. So let me process….Mitzi Gaynor, Nellie Forbush from the movie South Pacific, who EVERY classic musical theater nerd has watched “wash that man” right out of her hair, was coming to see ME play Nellie Forbush? No pressure, right??? I actually wonder that I wasn’t more stressed. I focused only on the show, knowing that thinking about her or the press or anything else would only weaken my performance. She was the cutest, sweetest lady. She came into my dressing room before the show and she held my hands and stared deep into my eyes…it was almost like her seeing herself 55 years ago. Surreal. A cast mate (I think) felt awkward in the silence and said “She makes a pretty Nellie doesn’t she?” and Mitzi said “Oh but it’s so much more than looks. Do you understand Nellie? Her family? Her upbringing?” All I could do was nod my head. She talked about the show with such love and fond memories. Told us each special things about our characters…I was inspired and touched. It was incredible. The cast boys said she visited them too and flirted with each one of them, even grabbing the actor playing Luther Billis and planting a big kiss on his lips. After the show I talked to her with my co-star who played Emile Debeque. She grabbed our hands and we stood there, the three of us holding hands in a circle, as she raved about how much she loved us and loved our chemistry. She said we were like “silk” together. I wish I could capture that moment again– the lobby was so noisy and she had such a cute but quiet voice. She leaned in to me and said she wanted to come back and see the show again, “but next time the two of us will get dinner before the show”. I would say “incredible” again, but I’m using that word too much. We are now half way through our 3 month run and still making magic. It’s inspiring to hear older audience members tell me after the show how we brought back happy memories. Some very old ladies make comparisons to other Nellie’s they have seen on broadway years ago, or things they remember from the movie. I can only giggle and say thank you. What an honor to be a part of this incredible show. To quote from the show, “when all you care about is here, this is a good place to be”. So many more stories, but they can wait. P.S. 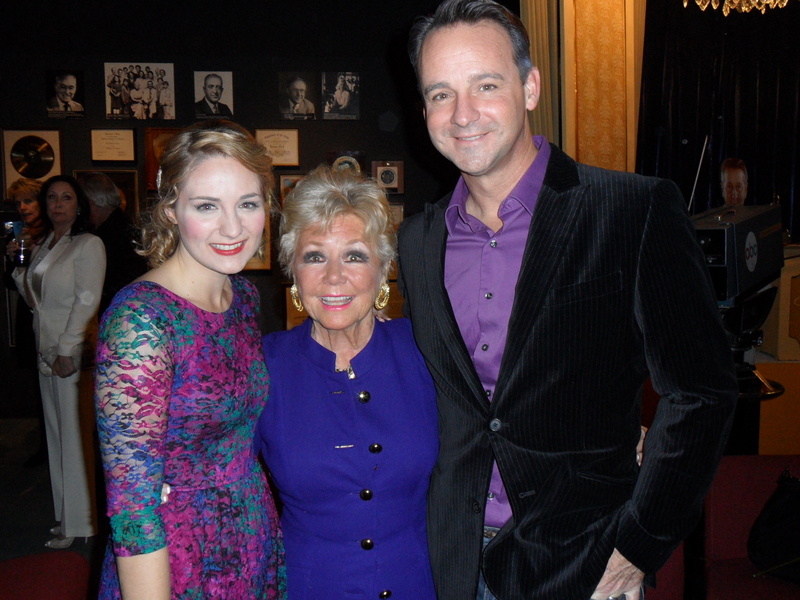 here is a picture of me with Mitzi Gaynor and my co-star, Randall Dodge! You’re adorable and have an awesome voice! Congratulations and keep up the great work and positive energy! It’s inspiring to read about such a wonderful experience. Wow, what an fun, awesome and inspiring story! That is awesome! Congratulations! Loved watching the clips from the show. You are doing an awesome job, and it looks like a great cast! You look so adorable in this show. You are so adorable, and so “Nellie” here, words cannot truly contain it all. Congratulations on this wonderful experience, and keep enjoying it! Thank you! I’m so happy to hear you express that because I have trouble finding words to explain what I love about Nellie. She is a special lady who will always be dear to my heart.